In the same March 1959 issue of American Modeler as the feature story on Mr. Nils Testor, founder of the eponymously named company, is this 2-page advertisement for Testors paints and glue. 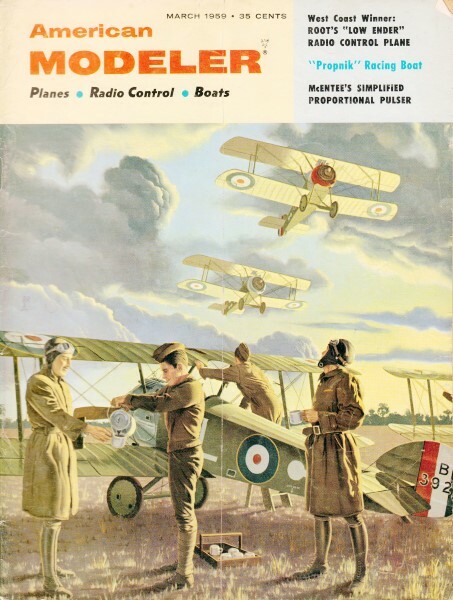 As pointed out in the Testors article, Nils Testor's first product was household glue, which, as it turned out, was perfect for building model airplanes. Anyone older than about 40 who is also reading this is almost certainly familiar with the Tests enamel paint kits sold in department stores and hobby shops for decades. I remember paying 19¢ for a 1/4-ounce bottle of paint back in the late 1960s. According to the BLS's Inflation Calculator that is equal to about $1.23 in today's money. That makes these sets of 9 bottles, priced at $10-$11, about right ... hard as that is to get my head around! 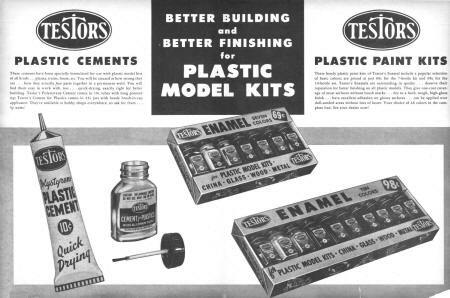 These cements have been specially formulated for use with plastic model kits of all kinds ... planes, trains, boats, etc. You will be amazed at how strong they are ... how they actually fuse parts together in a permanent weld. You will find, them easy to work with, too ... quick-drying, exactly right for better building. Tester's Polystyrene Cement comes in 10c tubes with long pointed tip; Testors Cement for Plastics comes in 2Sc jars with handy brush-in-cap applicator. They're available at hobby shops everywhere, so ask for them ... by name! These handy plastic paint kits of Tester's Enamel include a popular selection of basic colors; are priced at just 69c for the 7-bottle kit and 98c for the 10-bottle set. Testor's Enamels are outstanding in quality ... deserve their reputation for better finishing on all plastic models. They give one-coat coverage of most surfaces without brush marks ... dry to a hard, tough, high-gloss finish ... have excellent adhesion on glossy surfaces ... can be applied over dull-sanded areas without loss of luster. Your choice of 48 colors in the complete line. See your dealer now!